Now available in the Android market, a version of last year's PSP game Akiba's Trip, Akiba's Trip for GREE from Acquire. Patrol Akihabara looking out for blood-sucking "Kageyashi," and acquire as many maid cafes as you can. The maids will appreciate your protection, of course. How do you go about dispatching vampires? 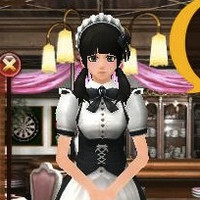 As your maid cafes do better business, you'll be able to afford better and better weapons, but maybe the title holds the pun about how you destroy them for good in this "medium maturity" game. You need a GREE account to play, but the download is free.